It’s a curious fact that while there’s plenty of information out there on the management of the high seas (or international waters), you rarely see the high seas in numbers. For instance, check out the pages over at the FAO or wikipedia. You get a decent amount of information on the legal institutions governing the high seas, but not much else. 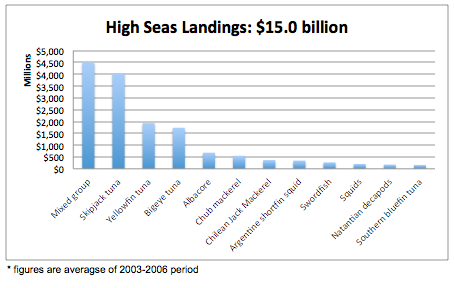 Frankly, while I support every bit of advocacy for better high seas management, I sometimes wonder if this lack of specificity doesn’t lead us fisheries conservationists to over-emphasize the importance of the high seas to global ecosystem health, perhaps at a loss to other areas, like inland waters and their freshwater fisheries. There would be a lot to unpack if we were to properly debate this, so instead, I thought I’d just add my grain of sand with a post providing easy to access numbers and graphics. 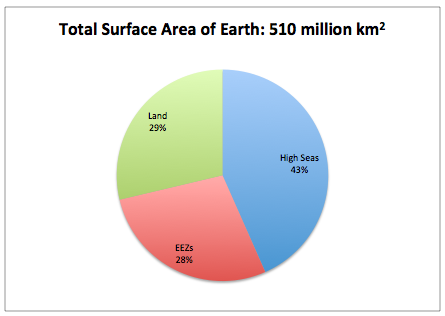 So here are the basic numbers on the high seas, as provided by The Sea Around Us Project. 1. The high seas represent 61% of the global ocean and 43% of the entire planet. 2. 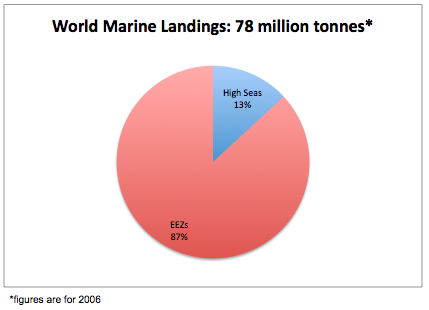 In spite of its geographic importance, the high seas are fished for just 13% of the annual marine fish landings by weight. 3. 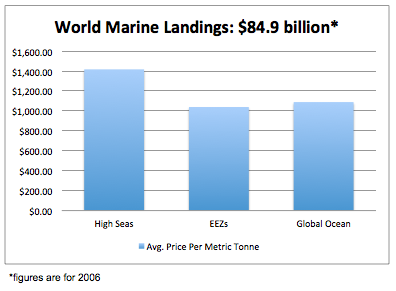 High seas catches are relatively high value, and account for 17% of the annual marine fish landings by value. 4. By volume, the four most important target species for high seas fishing operations are Skipjack Tuna, Yellowfin Tuna, Chilean Jack Mackerel, and Bigeye Tuna. 5. By value, the four most important target species for high seas fishing operations are a similar group of species: Skipjack Tuna, Yellowfin Tuna, Bigeye Tuna, and Albacore. 6. 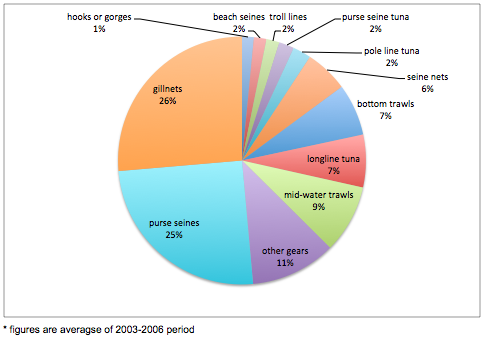 About half of all high seas catches are taken by gillnets and purse seine nets. 7. 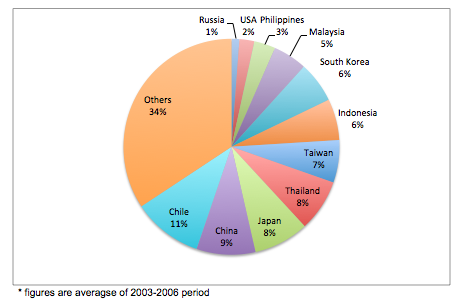 The four leading fishing countries on the high seas are Chile, China, Japan, and Thailand. However, caution should be exercised here as the true controlling influence of a vessel can be easily hidden with shell companies and the flexibility in flagging vessels afforded by international law. Hi Mark, great post! Not sure if you’ve seen our recent paper but if you haven’t, given the topic of this post you might be interested in it. Within the paper, we summarize some of the numbers relating to fishing in the high seas, similarly to what you’ve done here, and explore economic outcomes of scenarios where the high seas are closed to fishing. It was a fun exercise and has been great for encouraging debate and discussion on issues relating to the management of the high seas. The paper is available open access through Nature Scientific reports, http://www.nature.com/srep/2015/150212/srep08481/full/srep08481.html Would love to hear your thoughts! Dana, this looks terrific! I’m keen to read who you perceive to be the winners and losers, and perhaps even more as to the total losses of a total closure! I’ll see about going through this soon!